The Cumberland & Dumfriesshire Farmers Mart P.L.C. 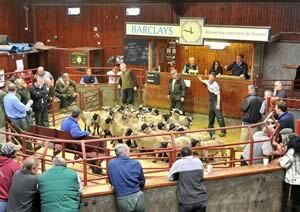 had forward 56 prime cattle, 2 young bulls, 20 over thirty month cattle, 5,711 prime lambs and 5,478 cast ewes & rams at their weekly sale at Longtown on Thursday 2nd September, 2010. A smaller show of 56 prime cattle was met by keener bidding and saw averages up 3p on the week. Top price to 177.5p for a Limousin heifer from H. & W.G. Robley, Townfoot Farm and purchased by J.A. Jewitt Meat Ltd., others 167.5p, 165.5p Townfoot; Charolais 169.5p, 156.5p Upper Mains; Angus 143.5p Townfoot. Bullocks to 166.5p for Limousin from Dashwellgreen, others 165.5p, 161.5p, 160.5p, 159.5p Dashwellgreen, 158.5p Nether Onsett; Charolais 152.5p Nether Onsett. Top per head of £1,076.63 for a Limousin bullock from Dashwellgreen, others £1,061.95 Nether Onsett, £1,060.68 Dashwellgreen; Angus £1,037.78 The Shaws. Charolais heifers to £966.15, £870.80 Upper Mains; Limousin £860.88 Townfoot. Young bulls sold to 126.5p and 125.5p for Shorthorns from Minsca. OTM’s saw trade much the same on the week with a top price of 133.5p (£861.08) for a Limousin cow from Messrs Ritson, Swaites with OTM bullocks to 115.5p (£993.30) for a British Blue from T. Armstrong & Sons, Sceughdyke. Other Limousin cows to 90.5p High Greenhill; Friesian 98.5p Dockray Hall, 88.5p (£743.90) Halltown; Simmental 89.5p Bonshawside; British Blue 89.5p High Greenhill. Bulls to 108.5p (£868) for a Limousin from Bonshawside. A larger show of 5,711 prime lambs was forward with trade again being the best of the week, all kinds in demand to average 169.6p. Top per kilo of 218p for Beltex’s from Mouldy Hills and to £113.50 per head for Charollais’ from Wester Parkgate, others £83.50 Cardew Hall; Texel £100 Carran, £98.50 Cowans and Becton Hall, £93.50 Glencartholm; Beltex £91.50 Mouldy Hills, £78.20 Sorbie; Suffolk £86.50 Justicetown and North House, £82.80 Slealands; Greyface £76.20 Nirvana, £73.20 South Slealands, £71.80 Kellah; North Country Cheviot £70.80 Dodgsonstown; Cheviot Mule £70.20, £69.80 North House; £69.20 Terrona; Hill Cheviot £69.80 Rosgill Hall; Half Bred £69.80, £65.20 High Moat; Leicester £67.80 Walton Highrigg; Blackface £66.80 Penpeugh, £65.50 Desoglin, £64.80 Minsca. The 1,049 lightweight lambs upheld recent high rates and sold to a top of £68.80 and £64.20 for Texels from Barrockend; Suffolk £62.20 Brocklewath; Blackface £60.80 Drumore Villa, £59.20 Roan, £55.80 Baitlaws; Greyface £60.20 Murtholm, £57.20 Rosgill Hall; Hill Cheviot £54.80 Whitefield and Main Side; Swaledale £49.80 Sanders Close and Coldshield. An increased entry of 5,478 cast ewes and rams attracted the usual buyers, with trade £5 to £7 up on the week. Top price of £178.50 for a Suffolk ram from The Whins, others £133.50 Lords Lot Farm; Texel £135, £128.50 Townfoot, £122.50 Laws Hall; North Country Cheviot £130.50 Bardnaclaven; Leicester £123.50 Sockbridge, £120.50 Allensgreen; Hill Cheviot £104.50 Newbigging; Romney Marsh £96.50 Holme Farm; Easycare £96.50 Crops Hall; Beltex £92.50 Whitehill Cottage; Swaledale £74.50 Westernhopeburn; Blackface £72.50 West Farm. Heavy ewes to £132.50 for Texels from Crookholm and Sockbridge, £128.50 Severs; Suffolk £112.50 Severs, £106.50 Roadside, £102.50 Seavers; Charollais £110.50 Severs, £103.50 Roadside; North Country Cheviot £103.50, £97.50 Sockbridge, £96.50, £90.50 Achscrabster, £90.50 Overacre; Beltex £98.50 Stackbraes; Leicester £98.50 Bluebell, £96.50 Minsca, £88.50 Severs; Half Bred £88.50 Bluebell; Greyface £88.50 Garvilland, £86.50 Stockwell Hall, £81.50 Lords Lot Farm; Cheviot Mule £88.50 Severs, £85.50 Falnash; Romney Marsh £79.50, £78.50 Holme Farm; Border Leicester £77.50 Gilmanscleugh Farmhouse. Hill ewes to £82.50 for Cheviots from Whitstone Hill, £81.50 Raeburnfoot, £74.50 Glenghervie; Lleyn £76.50 Harper Hill, £68.50 Glenapp; Blackface £68.50 Edges Green and Blackburn, £67.50 Tecket, £66.50 Glenghervie; Jacob £66.50 Golden Lane, £50.50 Longoe; Swaledale £60.50 Gallowberry, £58.50 Nunscleugh, £55.50 Randalholme, £54.50 Westernhopeburn; Kerry £58.50 Whitehill Cottage, £54.50 Bartondale; Herdwick £56.50 The Bents, £49.50 Stackbraes.